Diane Jacobs: " I contextualize my work by using word puns, text with dual meaning, and derogatory language as a catalyst to reveal old and new ways of thinking. I am fascinated by the allure of shadows and the interplay between illusion and heightened consciousness. In much of my work I use reflective materials to alter perception, scrutinize information, and bring the viewer into the dialog. "I merge life and art into one continuum. To come to any conclusion, the viewer must investigate her or his own relationship to the given topic." Portland, Oregon: Diane Jacobs / Scantron Press, 2012. Edition of 21 + 2 AP. 8 x 8 x 2" box containing 8 twice-folded prints (7.375" x 7.375" closed) and a felt with paper-pulp spoon. Images letterpress-printed reduction linoleum and wood blocks, pressure printing, polymer plates. Handset title page and colophon. Materials: gampi paper, wool felt, cast paper pulp, porcelain. Cast paper pulp spoon attached to block of wool felt. Bamboo box with hinged lid and three dropdown hinged sides. Cast porcelain turkey wishbone adhered in triangle hollowed on inside of the lid. Signed and numbered by the artist. Diane Jacobs: "Personal experiences brought Nourish to fruition: visiting Opal Creek’s pristine ancient forest, witnessing a breathtaking starling murmuration, listening to musical compositions that transcend cultural boundaries, and sleeping under the expansive starry night sky. 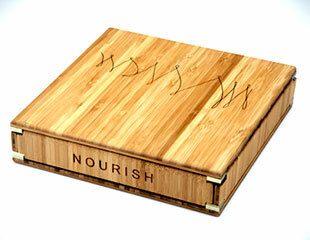 Nourish comes from gratitude and a desire to celebrate the wonders of our natural and created world. It also acknowledges that beneath this beauty looms environmental catastrophe: dying bee colonies, lack of safe drinking water, increasing oceanic garbage, loss of habitat for species whose diversity is dwindling, and our changing climate to name a few. Time is ticking, we must find our way through the labyrinth, unlock the doors of perception, and embody the notion 'to be with higher self.' We can become the spider that protects and weaves creative solutions." Each of the folded prints open to one of these images: bowl, sun (starling dance), ocean, fern, chicken, clock, keys (handwritten musical notation from Edward Cremo's 1986 composition Turnings), web. Portland, Oregon: Scantron Press, 2000. Edition of 120. 3.5 x 3.5"; 15 leaves. Structure is accordion-like with 15 double sided pocket pages. The text was hand-set in Weiss Roman, Weiss Italic, and wooden type and letterpress printed on Stonehenge paper. The images were silk-screened at the Women's Studio Workshop on Kozo paper. 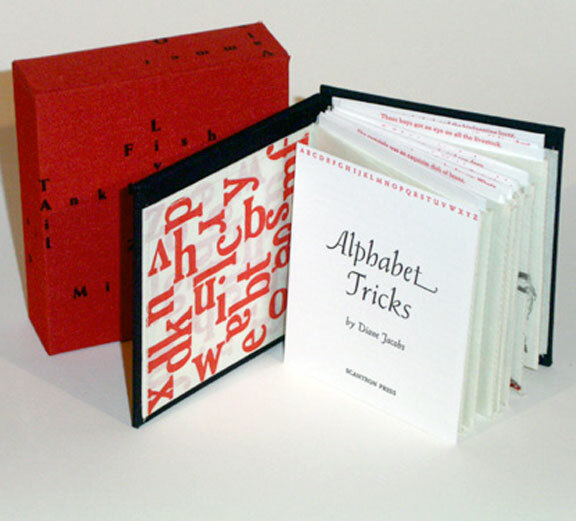 The slip cases were silk-screened by Thomas Wojak at W.O.R.K.S. and constructed by John DeMerritt. 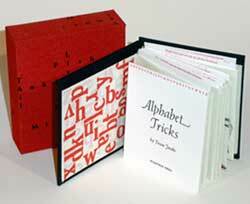 Diane Jacobs set and printed the text, created the artwork and constructed the books. Alphabet Tricks situates itself and women in that ambivalent space between a word's connotation and denotation, revealing society's contradiction between desire for and condemnation of feminine sexuality. 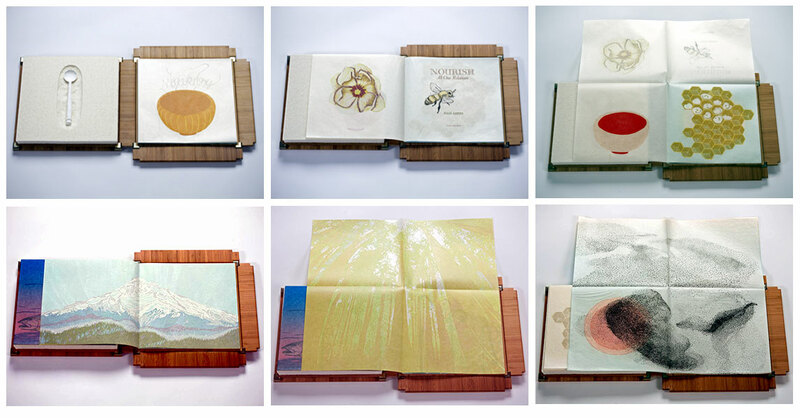 The book unfurls accordion-like; each panel is home to a word and its corresponding definitions. The definitions are complex creations, hovering between the so-called neutrality of the dictionary's opinion and the loaded, derogatory use which circulates throughout our culture. Reading Alphabet Tricks, the reader finds herself in that ambivalent place where assumed objectivity is exposed as already tainted by the mores of society. Portland, Oregon: Scantron Press, 2017. Edition of 28 + 3 AP. 12.75" x 8.625"; 30 pages. India ink drawings letterpress printed from polymer plates. Text printed from handset metal and wood type. Papers: Biblio, Gampi-shi, Shiramire, Mitsumata, handmade cotton paper, handmade abaca paper. Map folio and dedication moon hand-dyed using onion skins. Paper processes: pulp painting, handmade cotton paper molded over hand-carved clay disks, onion-skin dyed paper (yellow-brown), laser cutting. Five signatures sewn on vellum tapes. Bound in St. Armand paper. 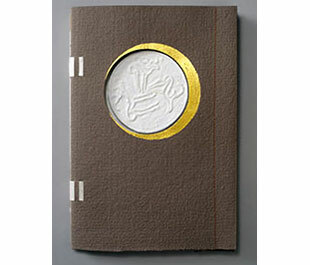 Circular opening on front cover ringed with 23K gold-leaf crescent moon. Signed and numbered on the colophon by the artist. Diane Jacobs: "AMAZONS is an artist’s book that celebrates women’s power by imagining the lives of legendary warrior women. In a world where violence against women is rampant and misogynist ideologies govern, I found solace in Adrienne Mayor’s The Amazons: Lives & Legends of Warrior Women Across the Ancient World. The written and visual material in the book was inspired by and derived from Adrienne’s dedicated research. 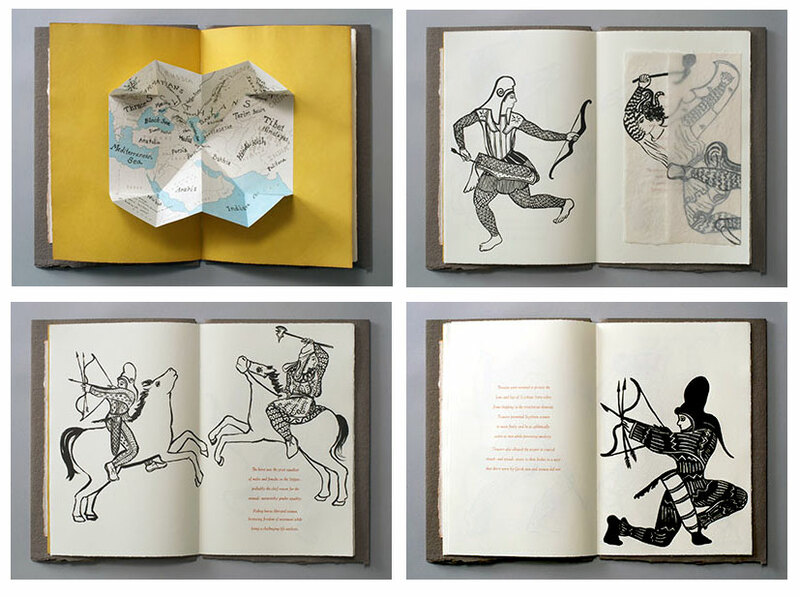 "[There are] ten India ink drawings of Amazons, as well as drawings based on tattoo imagery, … Each book opens with a unique pulp painting of a burial mound, clouds, and carved moon cast in handmade paper, and features a three-color pop up map depicting the names of these nomadic peoples and the regions where they roamed." "Three percent of the proceeds from the book will be donated to Planned Parenthood, with another three percent going to Honor the Earth to support the warriors fighting for Native environmental justice, sovereignty self-determination, and the preservation of Mother Earth."